Body uses up oxygen to get rid of /neutralize invading microorganisms and toxins (artificial ingredients, pesticides and heavy metals) - and can overwhelm our immune system if it is not working up to par. Artery-clogging plaque - initiated as a “repair patch” for “invader” damage, obstructs nutrient and oxygen delivery to cells. Free radicals are produced when dealing with microbes, toxins and unnatural electromagnetic radiation in the body - Free radicals first deplete the body's inventory of antioxidants and then start causing damage to your body “parts”. 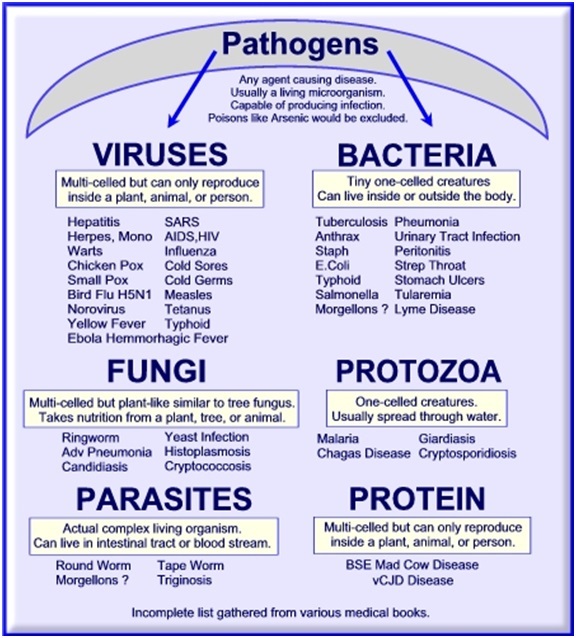 Microorganisms lie dormant inside our body's cells, developing into more and more harmful forms under more acidic, low-level oxygen,toxic conditions (from primitive microbes (endobionts) to bacteria to fungus, within their family species). - This is according to several eminent scientists - including AntoineBÃ©champ (a contemporary of Pasteur) and Gunter Enderlein, who found that Louis Pasteur's theory was wrong - viz. that all micro-organisms can only hold one form (monomorphic), and can only come from outside the body. Put a fresh, raw steak (with its active enzymes) and a cooked steak (with its enzymes destroyed) in the open air, and it is the cooked steak that soon becomes infested with maggots. This demonstrates how nature breaks down dead tissue or a dead body, returning it back to dust. - Micro-organisms thrive according to the medium and especially the pH level in which they live (most prefer a pH of ~6.5-7.5, but some can thrive in battery acid!) - later experiments showed that when the body becomes extremely toxic, bacteria can mutate into a virus. It is reported, that on his deathbed and in his notes, Pasteur admitted that BÃ©champ was right, and yet the text books still teach Pasteur's “germ theory”. Unnatural, man-made EMFs lower the cell's ability to produce energy - by depolarizing the cell membrane (i.e. running down the Cell “battery”). Toxins-Where do they come from? - AGEs (Advanced Glycation End-products) - AGEs are the end products of haphazard glycation reactions implicated in many chronic aging diseases. In glycation, a sugar molecule bonds to either a protein or lipid molecule without an enzyme to control the reaction, where they interfere with molecular and cellular functioning throughout the body. The skyrocketing sugar consumption in recent decades has significantly increased AGE formation and fructose and galactose apparently have 10-fold the glycation activity of glucose, the body's primary fuel. Stress - has poisoning effect similar to toxins and is a major contributor to free radical production in the body. Think about this when you are allowing a domineering boss, financial worries, looming deadlines, marital problems, testy children and past or present emotional issues to “get to you”. - From eating contaminated foods - eating foods containing dyes, preservatives, herbicides, pesticides, excessive heavy metals; drinking “chemical cocktail” soft drinks; drinking/cooking/bathing in "treated" (chlorinated/fluoridated) water. ✔ Personal care items e.g. bars of soap, shaving cream, hand lotion, toothpaste, deodorant, cosmetics, facial creams, hair spray, cologne, perfume, shampoo and hair conditioner (your pores are nicely opened by hot shower water). ✔ Bathing in chlorinated /chemically treated water. ✔ Combustion engine fumes - e.g. car exhaust fumes"
- By excessive use of Pharmaceuticals - Antibiotics promote an excess of “bad”intestinal bacteria. We have the illogical approach of trying to 'cure'a toxic overload by ingesting more toxic chemicals in the form of pharmaceuticals E.g. aspirin, antihistamines, countless drugs. - Eating Micro-waved food - introduces "not-so-convenient", damaging free radicals into our bodies. - Disrupt the Cell“ battery” level - by structural damage to mitochondrial membranes. - Use up oxygen when removing toxins from the body - thus disturbing oxygen-dependent energy production and making conditions more microbe-friendly. - Heart muscle cells and neurons - in such cells, the accumulation of cellular garbage may be a very significant factor in cellular aging and death.